There’s a lot of talk about a coming future of ‘bionic’ devices, aiding those with sensory and motor disabilities. In reality ‘bionic’ sensory devices have already been with us for over 30 years in hundreds of thousands of people. The cochlear implant is a ‘bonic ear’ that enables many deaf people to hear. They’ve advanced to the point that even tiny kids get them now. The idea of the cochlear implant is remarkable, really. A semi-circular cut is made behind the ear. 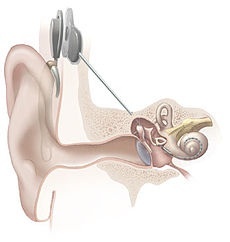 A wire is threaded into the cochlear, the fluid-filled spiral-shaped organ in our inner ear lined with hair cells. The wire from the device sends electronic signals to the auditory nerve that the wearer learns to recognise as sound. Credit: NIH, public domain. Sourced from wikimedia. The wire leads from a small unit that is placed sealed under the skin. The person wears a device looking like a behind-the-ear hearing aid that is wired to a magnet that is placed on the skin above the internal unit, like in the infant above. The external magnet is attracted to the internal unit, holding it in place, and the signal is transmitted through the skin as a radio frequency signal that is received by an induction loop in the internal device. The internal device is powered by this transmission. There is no wire through the skin, as some of the early (single-channel) devices had — these were prone to being a route for infection, one of the many challenges overcome in developing the cochlear implant. 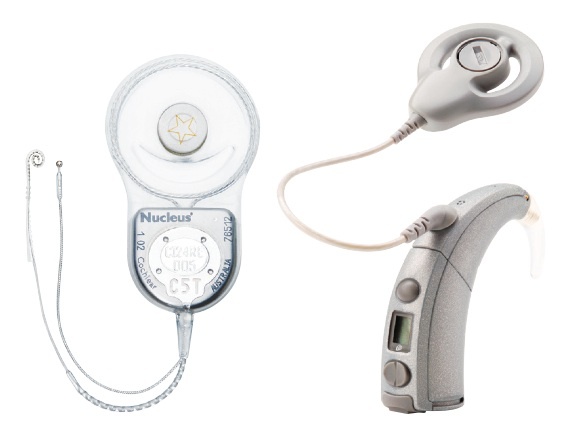 The hearing aid unit has the usual microphones, battery and a digital signal processing chip, that transforms the original microphone signal according to the parameters set by the audiologist as they adapt the device to the wearer. It isn’t a case of instant speech recognition as the device is turned on, but a process of learning to associate the signals with sounds. The image is taken from the Hearing Association of New Zealand information card on cochlear implants, available as a PDF file. (Picture there courtesy of Cochlear Ltd.) The electrode with a spiral end is inserted into the cochlear; the other is a ground wire. In a normally-hearing person sound vibrates the (basilar) membrane of the cochlear, moving the hair cells, which stimulate the auditory nerve. Different frequencies of sound dominate different parts of the membrane: high frequencies don’t travel far; low frequencies travel further. This creates a frequency-to-place mapping that our bodies use to identify the frequencies of sound. The electrode of the cochlear implant has several wires (e.g. up to 22) of different lengths, by-passing the hair cells and directly stimulating the auditory nerve. When the audiologist “maps” the input onto the electrodes that the wearer is responding to, they assign higher frequencies to the shorter electrodes and lower frequencies to the longer functioning electrodes, mimicking the frequency-to-place mapping that functions through the basilar membrane. Cochlear implants are still mostly implanted into one ear, but there is an increased trend to implant both ears giving bi-aural hearing that benefits the wearer. In New Zealand cochlear implants are funded through Ministry of Health, prioritised to children. A brief introduction is also available on the Hearing Association of NZ cochlear implant information card (PDF file). This year’s Lasker-DeBakey Clinical Medical Research Award was awarded to Ingeborg Hochmair, Graeme Clark, and Blake Wilson for their work developing the cochlear implant. It‘s one measure of the cachet of these prizes that 83 Lasker awardees have gone on to win Nobel Prizes. Cochlear implants are a fine example of how research draws on skills from disparate sources. Developing these devices draws on a mix of audiological knowledge, neuroscience and anatomy, surgery techniques, engineering hardware (on several levels), finding the best way of delivering the electrical signals so that they might be perceived by the patient as speech and so on. A titbit: in New Zealand there are three official languages, English, Maori and NZ Sign Language (NZSL). 2. The Lasker Foundation offers four awards recognising “major advances in the understanding, diagnosis, treatment, cure, and prevention of human disease”. The awards cover basic science, clinical medical research, an achievement in medical science award and a public service award. It’s often said that Lasker Awards signal possible future Nobel Prizes and that’s been the case for 83 of the Lasker awardees thus far. The first attempt to develop a clinical CI was in 1957 by Djourno and Eyriès. A recipient was implanted with a single channel device. Unprocessed sounds were transmitted via a pair of solenoid-like coils. The link was therefore transcutaneous; it did not require a break in the skin after implantation. This device failed after a short time and another device was implanted. After this second device failed, Eyriès refused to implant a third device. He urged Djourno to collaborate with an industry partner to build a more reliable device. Djourno refused because he believed that academia should not be tainted by commerce. Djourno found another surgeon, Roger Maspétiol, who implanted a second patient in 1958. Although these recipients were unable to understand speech with the device alone, it helped with lipreading by providing the rhythm of the speech. 4. I suppose I have a bias, being a ‘software person’! In reality many contributions make up the modern CI, but I think it’s easy to forget the software contributions buried in the midst of new hardware developments. 5. It can be an useful starting point, but you need to verify claims and, as in this case, there can be missing material that is relevant. 7. I have to admit I find this frustrating and I’m left wondering what the benefit to blocking embedding these particular videos are. Sounds from Silence: Graeme Clark and the Bionic Ear story. ISBN 1 86508 302 X, Allen & Unwin, 2000. This is an autobiographical account of Prof. Clark’s work on the Australian cochlear implant device. ISBN 1-895579-32-5, Trifolium Books Inc., 1998. This personal account of losing hearing, then later regaining (some) hearing is now 15 years old — perhaps a testimony to how long cochlear implants have been around. There are many newer personal accounts and this one is very likely out of print. ISBN 0 330 32090 4, Picador, 1991. ISBN 0 521 42998 6, Cambridge University Press, 1995. This book is a personal choice – it presents the results of a longitudal study of deaf children growing up over an 18 year period. I have sympathies both ways. The MoH only has a finite pot of money and will no doubt be trying to yield the greatest benefit they can from it (as you’ll know, they prioritise to kids and one only). I recall reading a research paper or two arguing to the benefits of bilateral CIs (several years ago now) and anecdotally I can imagine there is benefit to be had from my experiences with a loss dominantly on one side more than the other. There is apparently also an argument that currently a better gain than implanting a second CI can be gotten by using FM systems with one CI. I don’t know the story behind these claims – might be worth tracking down. Hi Grant. You may like to look at our website (2ears2hear.kiwi.nz) for some more information. In terms of costs for bilateral CIs… the MoH have said it is not the money that hold them back. Its that they have not done the policy work. Where the policy work has been done in every other international jurisdiction, children now receive bilaterals. FM systems are necessary for unilateral children but are no where near as good as bilaterals. In a classroom setting the child loses the input from their peers. All they get is the input of their teacher. Peer learning is vital. At 2ears2hear we argue that there are three compelling reasons for children to get two CIs at the same time. Its better, cheaper and safer. Safer because the child can hear the direction of dangers and if a device failed, they don’t lose 3-6 months of schooling while the one CI is replaced. The page you link to offers no supporting references; there’s no way to judge the merit of the claims made. You might want to back it up with references to, say, systematic surveys of the field. That the authors use particular adverbs is neither here nor there. What is important is evidence for the claim, how well it’s supported. Furthermore, I feel your quotation is lifted somewhat out of context. The way it’s presented gives the impression it’s the conclusions of primary research paper or a systematic survey but it is actually from within a review paper (which are commonly less formal) and is a brief introductory summary leading on to discussing possible use of wireless communications between the pair of CIs. For what it’s worth I had a very brief peek into PubMed and skimmed the abstracts of just two recent reviews of the bilateral CI literature. (Certainly not enough to go on and not something I have time to explore either, but it’s late at night and I’m trying to get something back to you before heading off for the night.) The reviewers note that the level of evidence for research on bilateral CIs is generally poor – I would guess that’s just from the studies being too small to draw strong conclusions from. They note that the results found favour bilateral CIs (as you do); both reviews called for more detailed studies. I’m not saying bilateral CIs are not of benefit but that there is a reason that “Scientists and Researchers tend to be reticent in their language when writing academic papers” and it’s not through timidity about drawing conclusions per se, but because they are trying not to exceed what the evidence can formally say. Results based on limited evidence are usually presented as ‘indicative’ or ‘suggestive’ rather than conclusive. You’d need to follow up on this yourself I’m afraid as I simply haven’t time to. Personal preference perhaps, but I prefer sites that give both the good and bad of all positions using neutral phrasing (rather than championing one position over others: I like to let the better positions arise from the evidence rather than the wording. re MoH funding, it seems to me that bilateral CIs would require increased funding from somewhere for at least however many years until the scheme as caught up with the follow-on support of those who have one CI. So I’d have thought there is still an element of funding level involved. You might like to read the sections under “Bilateral CIs” at the top of the site. This is where the ‘evidence’ is set out and referenced. Yes data of educational outcomes is limited (National Standards will sort this out over time) in NZ. However there is very strong data that bilateral hearing performance is superior. If you look at the UK for instance, they concluded the quality of life data was positive for bilaterals as far back as 2009, when they started funding bilaterals. In 2011 they reviewed this and concluded that it was right. They then finished a 3 year audit in 2013 and again concluded they were right again. Just one example. Have a read around the site. You will find the argument of better-cheaper-safer is robust. You seem to be getting the wrong idea. I wasn’t taking a stance of bilteral CIs or not, either for or against. I was pointing to how the website presents stuff. JFYI the two reviews I briefly encountered. My emphasis added, so you can see where my earlier remarks came from. Both from 2013. The effectiveness of bilateral cochlear implants for severe-to-profound deafness in adults: a systematic review. CONCLUSION: Pooling of data was not possible because of the heterogeneity of the studies. As in the NICE review, the level of evidence of the included studies was low, although some of the additional studies showed less risk of bias. All studies showed a significant bilateral benefit in localization over unilateral cochlear implantation. Bilateral cochlear implants were beneficial for speech perception in noise under certain conditions and several self-reported measures. Most speech perception in quiet outcomes did not show a bilateral benefit. The current review provides additional evidence in favor of bilateral cochlear implantation, even in complex listening situations. Cochlear implantation in adults: a systematic review and meta-analysis. CONCLUSIONS AND RELEVANCE: Unilateral cochlear implants provide improved hearing and significantly improve QOL, and improvements in sound localization are noted for bilateral implantation. Future studies of longer duration, higher-quality reporting, and large databases or registries of patients with long-term follow-up data are needed to yield stronger evidence. Again, not taking a stance. That’s cool. Just wanted to point you to the information on the 2ears2hear site. Interestingly the QOL work for the NHS is what you have noted. For adults the QOL jump is not that much for the second CI. For a child, the QOL jump is significant. This is probably because any gap between CI 1 and 2 is sub-optimal in terms of auditory development. Hope you enjoy some of the ‘light’ reading in the research page.